After a wet winter in most of the state, with some areas experiencing their wettest December through February rainfall, things dried out in March. The statewide average was only 3.27 inches, just a little over half of the normal 6.16 inches. It was dry enough that by month’s end, drought conditions were designated for the southern and southeastern parts of the state. The impact was most evident in the stream flows as the vegetation charged out of its winter dormancy and drew heavily on the soil moisture to come alive with branch and leaf development. Some stream flows in SE Alabama dropped to a 1 in 20-year dry spell by month’s end. 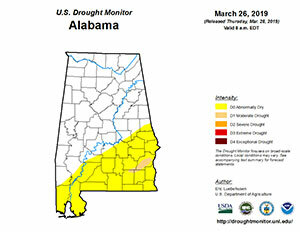 Though dryness was the operative word for March, Alabama’s variability was evident as a few stations exceeded their average March total with Chatom, about 45 miles north of Mobile, leading the pack with 8.22 inches. 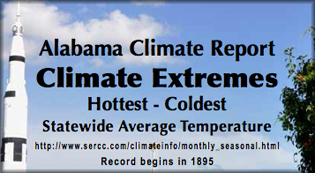 Statewide, Alabama’s temperature finished the month 0.2 °F below the long-term average at 54.9 °F. Many of you remember just 7 years ago in 2012 when March was 9.5°F above average for the hottest March on record. 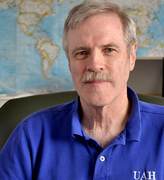 (The coldest was 1960 at 9.8 °F below average.) The warmest daily high this year was Mobile (Brookley Airport) with 86°F on the 11th. It was cold this March too with hard freezes between the 4th and the 7th when temperatures dipped into the teens at several locations. The coldest day of the month was felt in Addison at 15 °F. 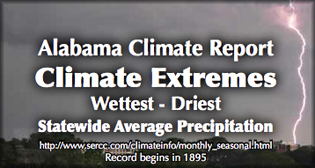 When I look at long-term climate indicators, there is not much change at all to see in Alabama since some records began mostly by 1875. We track tornadoes, hurricanes, rainfall, temperature – all the factors about which people are curious because we all live with these events. At this point, I think what I said in a presentation made on the Weather Channel in 1988 is still an important way to look at this: “If it happened before, it will happen again, and probably worse.” So, be ready for anything. 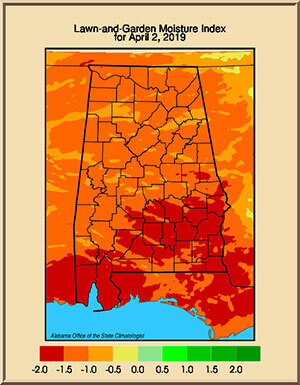 Copyright (c) 2010-2018 Office of the Alabama Climatologist :: The University of Alabama in Huntsville. All rights reserved.